This is the largest first round funding for an Indian startup. 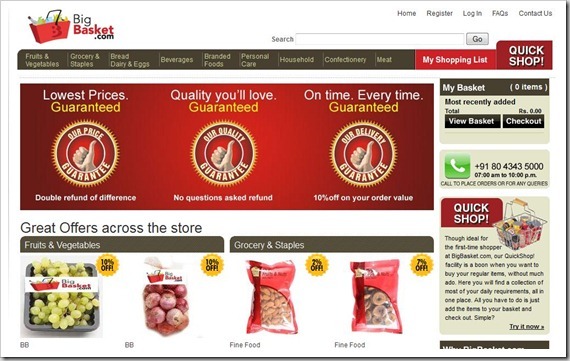 BigBasket.com, a online grocery store founded by serial entrepreneurs K. Ganesh & Meena Ganesh (of TutorVista) along with Fabmart & Fabmall founders (V S Sudhakar, Hari Menon, Vipul Parekh and V S Ramesh) has bagged a cool USD 10 million first round funding according to report in TOI. With names like those behind the venture, it is not too surprising that VC’s are backing BigBasket.com big-time. Although, online grocery selling has been much talked about vertical, no single player has been able to make a mark. Most offline grocery superstores like Food Bazaar, Reliance Fresh and Star Bazaar have their online shops, but consumers have not taken fancy to them. BigBasket.com hopes to bring about a change here – and like others, they have an ambitious plan of setting up ambitious direct-from-farmer supply chain to compete on pricing and make it attractive. I did go through Bigbasket.com briefly, and as of now, I am not sure if they have the direct-from-farm supply chain in place, as the prices seem to be similar to what you would expect from normal vendors. Given the track record of people behind Bigbasket.com, this one e-commerce startup will be one to be watched closely! "Bigbasket.com gets USD 10 Million funding from Ascent Capital", 5 out of 5 based on 1 ratings. Big basket sevices is really awesome wth fresh content. Now Pune have their online grocery store with a team of high experience in offline grocery network,merchandising,operations and marketing skills. You can shop for your online grocery and daily essentials at http://www.punexpress.com or call at 7276303630 to order. This could be considered to be FDI in retailing and will be struck down. i think flipkart is the most influence start up in india on the internet. Online Groceries is interesting market to venture. As said, it’s hard market to prove your play and we have seen many tried to execute it well but failed drastically which included big players like Reliance as well. Now heard even Furture Group is betting on it. The key here is delivery. One who orders groceries cannot wait beyond 12 hours or max 24hours for the goods to be delivered at the door step. The game is can if you deliver within in 1-2 hours hours from the order time. If you can, then you could be the leader. Prashanth – absolutely right. One of the biggest problems with Online Grocery store is wastage – Many items have very short shelf life. And the ideal shelf life is even smaller. To have a very fast turn-around and then sell it equally faster is a challenge very few have been able to crack. However, given the background of people Big Basket have, they must have figured this out. Lets wait and watch how these guys do in coming months…going to be very interesting..
Hi Prashant , I am into this similar space for the past 6 months. I would appreciate if you could share your experience with me.